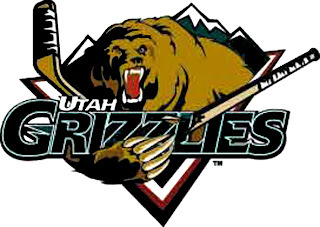 West Valley City, Utah – Utah Grizzlies Head Coach and Director of Hockey Operations Kevin Colley today released the team’s training camp roster for the 2012-2013 season. The team opens training camp today at 10:30 a.m. at the Utah Olympic Oval in Kearns. The roster of 23 includes seven returnees from last year and nine total who have played for the Grizzlies before. Leading scorer from last year Paul McIlveen is on this year’s training camp roster as are four players acquired by Utah last year via midseason trades as the Grizzlies finished the regular season as the hottest team in the Western Conference. The team is experienced on defense, with five of the seven blueliners having played in the ECHL before. Drew and Josh Daniels make up the first set of identical twins in Grizzlies history. Riley Armstrong brings two games of NHL experience with San Jose in 2008-2009. The initial roster does not include any players assigned by the Calgary Flames organization from their AHL camp in Abbotsford, British Columbia or any other players currently in AHL camps with other organizations. Riley Gill: 38-22-9 in 71 career ECHL games with Kalamazoo and Victoria. Named the ECHL Goaltender of the Month in February of 2012. Went 24-15-5 during 2011-2012 regular season and 8-6 in playoffs as Kalamazoo went to conference finals last season. Troy Davenport: Played in Sweden last year after college hockey at Cornell University. Ryan Donovan: Rookie played four years at Finlandia University. Josh Burrows: Had a plus-nine in 12 games last year with Utah along with three assists after being acquired from Gwinnett. Jeff Buvinow: 10 games with Trenton of ECHL last year after four seasons at Brown University. Drew Daniels: Selected by San Jose in 2008 NHL Entry Draft. Rookie played three years at Northeastern University. Alain Goulet: Has played 192 pro games with 105 in the ECHL and 87 in the AHL. Played last year with Bakersfield and Cincinnati of the ECHL totaling eight goals and 18 assists for 26 points in 62 games. Trevor Glass: Suffered season ending injury in the second game of the season last year with Utah after tallying an assist. Spent entire season with Grizzlies rehabilitating in 2011-2012. Aaron Schwartz: Played with Bloomington of CHL last year. Evan Stoflet: West Jordan resident played with Utah from 2008-2009 and his plus-21 in 2008-2009 is the highest by a Utah defenseman since 2000. August Aiken: 17 goals and 18 assists in 52 games with Louisiana of the SPHL last year in rookie season. Riley Armstrong: 453 career games, including 402 in AHL and 2 with San Jose of the NHL in 2008-2009. Had two assists in two games with Utah in 2010-11, but did not play a home game. Has three goals and six assists for nine points in 11 career ECHL games. T.J. Battani: Rookie played last year at Ryerson University. Justin Daniels: Selected by San Jose in 2008 NHL Entry Draft, rookie played three years at Northeastern University. Chris Donovan: Third year with Utah. Has nine goals and 23 assists for 32 points and 134 penalty minutes in 91 games. Kory Falite: Had 20 points (seven goals, 13 assists) in 30 games with Utah last year after being acquired in trade from Florida. Won Kelly Cup with Alaska as rookie in 2011. Patrick Gaul: Rookie played four years at the University of Notre Dame. Denny Kearney: Had four goals and 12 assists in 33 games with Trenton and one goal and four assists for five points in six games with Springfield of the AHL last year in rookie season. Curtis Leinweber: Rookie played four years of college hockey at University of Alaska-Anchorage. Tommy Maxwell: 292 pro games with 155 in AHL and 137 in ECHL. Has 19 goals and 28 assists for 57 points in 937 penalty minutes in his career. Paul McIlveen: Grizzlies leading scorer from last season had 30 goals and 37 assists for 67 points in 62 games. Has 32 goals and 43 assists for 75 points in 72 games with Utah last two years. Colin Vock: Had nine goals and nine assists for 18 points in 33 games last year with Utah after being acquired from Gwinnett. Ryan Watson: Had hat trick in final game of regular season last year with Utah against Bakersfield to total five goals and seven assists in 43 games. For more information, visit www.utahgrizzlies.com. Tuesday, October 9; Maverik Center; 12:15 p.m.
Saturday, October 13; Idaho at Utah, 7:05 p.m.